Really? The cost would seem astronomical of equipping almost every community in New Zealand not only with the resources to cope with a Nelson-scale fire, but with callouts to other fire events occurring simultaneously in the vicinity. Clearly, something less is likely to be on the cards, give the affordability issues involved. By the same token, climate change is underway, though – and the firefighting resources to deal with it will need to interact with the foreign ownership of our forests, especially since foreign investors are being expected to provide a goodly amount of the planting and funding for the Billion Trees programme. •	a change in rainfall patterns – with increased summer rainfall in the north and east of the North Island and increased winter rainfall in many parts of the South Island. •	Water demand will be heightened during hot, dry summers. •	Longer summers with higher temperatures and lower rainfall will reduce soil moisture and groundwater supplies. •	Drought intensity will likely increase over time. Drier conditions in some areas are likely to be coupled with more frequent droughts. •	River flows are likely to be lower in summer and higher in winter. Tinderbox conditions ahead, in other words. Yet according to a climate expert canvassed recently by RNZ several regions already deemed to be at high risk – eg Marlborough, East Cape, Canterbury – are likely to see only slight increases in their drought/fire risk conditions in future. Reportedly though, the fire risk will rise considerably in some regions not currently perceived as belonging in the high risk category: such as Central Otago, the Manawatu and some areas around Wellington. 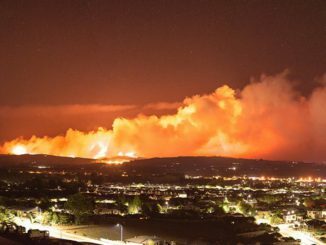 Currently, it has yet to be determined how the resources to fight the additional, higher intensity fires that global warming is likely to deliver will (a) be deployed and (b) paid for. Also… will the affordable level of resources be deployed mainly to defend the communities judged to be most at risk, or will they be deployed disproportionately in order to defend the forests owned by foreign investors? On that score, what contractual onus is/should be placed on the foreign owners to improve their preventative firefighting game, in the light of what global warming has headed our way? Will that firefighting capability be factored more heavily into the Overseas Investment Offices application of the “benefits” test applied before approval is given for selling forestry assets to foreigners? If not, taxpayers could end up footing the bill to ensure that forest assets owned by foreigners do not come to grief. Insurance, as Christchurch residents have discovered, may only take you part of the way, at best. Right now, and while the Nelson fire continues to be a problem, it is not surprising that more questions than answers exist about how New Zealand plans on managing the fire risks that are being posed by climate change. Some hard calls though, are waiting to be made. February is a cruel month, for Simon Bridges at least. This weeks Newshub/Reid Research poll has seen Labour open up of a six point gap on National, at the same time as Judith Collins has eclipsed Bridges as the preferred Prime Minister, even though both are registering barely above margin of error territory, and both are far, far behind Jacinda Ardern. Still, if those same poll gaps – or something like them – are confirmed in the next round of polls, Bridges will be looking over his shoulder at a leadership challenge. Usually, any coup would need to be executed by mid-year, to allow sufficient time for the new team to prepare for Election 2020. Mind you, since the likely replacement (Judith Collins) is a very well known quantity, National has more time on its side than normal. Currently, Amy Adams does not look like being a leadership contender. Bridges will be calling – a little desperately – for patience and restraint. Since 2019 is the year in which Labour will need to deliver on tax, the economy, welfare and housing, there is still room for hope that all of this vast ambition will come to grief, to the benefit of National as the only default option. Patience is a virtue, Bridges will be saying. Still, as this poll suggests, it is much easier for National to get away with peddling inaction as a virtue when it is in government, than from the opposition benches. Meaning: in policy terms, National has been running on fumes from the Key era for years, and the public may have finally reached that conclusion, too. Regardless of who holds the top job, National is seriously lacking in the vision thing. Sure, it wants to be in power, but it has all but forgotten the reason why. The other aspect of this week’s poll… is that with New Zealand First on 2.9% and the Greens barely scraping over the MMP threshold at 5.1%, we are all at some risk of reverting to the two party dominance that we suffered from during the FPP era. As always, NZF will need Winston Peters to pull them back into contention next year, on the campaign trail. For the leader of a one man party, retirement is never an option. At the risk of bad taste, this could be a timely occasion to replay the Staves version of ye olde Bruce Springsteen classic.